At this past Thursday’s dual meet with D1 Woodbridge High School, our JV and Frosh/Soph Girls gave strong performances to win, while the Varsity Girls narrowly lost, neck and neck, down to the last event. The Sea King boys (V,JV, F/S) competed against a deep Woodbridge program, but gave a great effort with many placing in the top 3 finishers. Due to this being a hand-timed meet, scores for only the top 3 finishers for most events were officially recorded. Our apologies that the Meet Host (Woodbridge) was not able to provide times/scores for athletes other than the top 3 finishers, except in a few cases. Pacific Coast League Prelims will be held tomorrow at 2PM at University High School. See below for more details and printable schedule. Note: Due to this being a hand-timed meet, scores for only the top 3 finishers in each event were officially recorded. Our apologies that the Meet Host (Woodbridge) was not able to provide times/scores for athletes other than the top 3 finishers. Location: University High School track stadium. Please respond to this email if you can bring waters/snacks. If you haven’t made it out to cheer our athletes on, please join us at the final meet where ALL of our Sea King athletes will be competing. The PCL Finals on Friday evening will be for those who qualify. Note: This is Tuesday, 5/1/18 schedule and includes prelims(ALL levels) and finals (F/S and JV only) schedule. This is a guide, and actual times may vary. Varsity Finals will be held on Friday, May 4th at University High School. THE source for everything you need to know, with streamlined ways to make Registration, RSVPing, archiving past newsletters and finding meet info and results at your fingertips! With the help of key parents, a new website has been created especially for Sea King Running. Janice Grace, mother of Soph. jumper Devan Grace, lent her expertise in website creation and we are excited with the results! Thank you, Janice! Click here to explore the website, and save it to your bookmarks. The first thing you will notice is the RSVP and ticket order form for our End of Season Track & Field banquet. PLEASE take 2 minutes to use the Paypal/Credit Card feature to purchase your tickets, and consider providing a donation to express thanks to the many coaches who have helped out our athletes this season! Please RSVP SOON! It’s EASY through the new website! 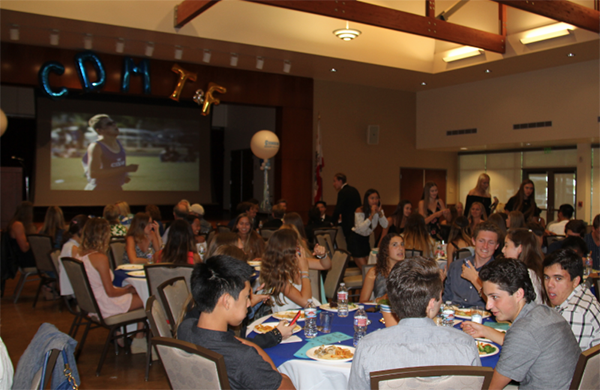 We invite you to attend our end-of-season track and field celebration. Join us to celebrate all of our athletes, especially our seniors, who each prepare inspirational speeches which can be very motivating for the younger athletes. Come hear from our coaches, enjoy a great meal and close down the season with some good times for all! this convenient new platform and think you will be too! at the University High School track stadium. Please respond to this email if you can bring waters/snacks for our last Pacific Coast League dual meet of the season. The following two meets afterward are our League Prelims and Finals. If you haven’t made it out to cheer our athletes on, please join us at this meet!